HOLLYWOOD VAMPIRES have been dubbed a supergroup by many publications and reviews. I don’t tend to agree with that classification. I personally would describe this group as a who’s who of rock n' roll royalty. Bands in the past that were called supergroups haven’t always ended up with the best reputations and lacked longevity. HOLLYWOOD VAMPIRES certainly have the class, talent and notable accomplishments to surpass any of the stigmas of supergroups and deserve more of an optimum description. Founded in 2015 by Alice Cooper, Johnny Depp and Joe Perry, these names don’t need much of an introduction! Following their self-titled album release, Hollywood Vampires in 2015, the guys started performing on the sunset strip, with their debut shows at the Roxy Theatre (West Hollywood) in Los Angeles September 16 & 17, 2015; Two shows back to back with a list of rock starts that didn’t stop. The HOLLYWOOD VAMPIRES were put together to pay homage and honor the memories of rock stars that passed away in the ‘70s from living a life of excess. In 1969, in the upstairs bar of the Rainbow Bar And Grill on Sunset Blvd, Hollywood Vampires were born. The Rainbow was the place that rock stars practically lived at and or traveled through constantly. Alice Cooper, an original founding member, said to join, you simply had to out drink all the members. Minus the drinking and wild escapades Alice and Johnny thought in the spirit and memory of the vampires, they should live again. The Self-titled album release was collaboration of immense talent of the rock world and modern day HV members. Produced by Bob Ezrin and line up of musical geniuses, this album is a well put together resurrection of amazing rock n' roll. Added talent to the deluxe album that joined the core members Alice, Johnny, and Joe Sir Paul McCartney, Perry Farrell, Dave Grohl, Joe Walsh, Slash, Robbie Krieger, Zak Starkey, Brian Johnson, and Kip Winger. The new digital album that was released February 12, 2016 has 17 tracks. Two are previously unreleased and one is a new original. The intro of the album is right out of a vampire movie; Spooky, mysterious and gothic. The late Sir Christopher Lee narrates the introduction and sets the mood and tells the pretense to this album perfectly. The original track and hot single on this release, “Bad As I Am”, was written by Johnny Depp, Tommy Henriksen and Bruce Witkin and features Matt Sorum, Alice Cooper and Joe Perry. The single showcases each individual talents, not just focused on Depp. “Seven And Seven Is” is an unreleased track from the album sessions that Alice originally covered in 1981. THE WHO’s original “I’m A Boy” is also featured. This history of the artists that are on this album is astounding. You can hear the sounds of so many influences. Listening to track #6, “Break On Through”, Alice eerily sounds like Jim Morrison and he covers this in total perfection. LED ZEPPELIN’s “Whole lotta Love” has Alice doing the harmonica intro and leads the song into a gritty version that rocks. Joe and Johnny sound badass on this track and backup vocals are perfect. Most of this album is covers paying respect to their fellow rock stars and heroes. I have to say you don’t even remember them playing covers as the album continues track after track. These guys are a well-oiled trio. Not only can you not help to just be in awe of the guys from their own Hollywood histories, but you realize the variation of talents they have listening to this album. If you like good old Rock, this album does not disappoint. Listening to the album was like being transported into a Rock n' Roll Hall Of Fame induction ceremony and these guys were playing all the inductees' songs, of which they executed flawlessly. U.S. Tour dates start up again July 1st and sixteen more July dates follow. Touring members that will join them are Matt Sorum (GUNS N’ROSES/ THE CULT) on drums, Tommy Henriksen (Alice Cooper) guitar, Bruce Witkin (THE KIDS) piano and guitar, and Robert DeLeo (STONE TEMPLE PILOTS) on bass. They're selling out venues quickly so get your tickets if they are coming to your city. 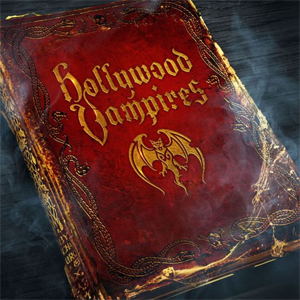 Grab a copy of Hollywood Vampires in the KNAC.COM More Store right HERE.